GARDINER — No game is ever over in the first half, but it certainly looked that way Saturday night when Gardiner took a 14-point lead against Winslow in the second quarter. But foul trouble came back to bite the Tigers and the visiting Black Raiders chipped away at their lead. They caught them in a wild, foul-filled fourth period and sealed a 44-43 win when sophomore Devin Fitzgibbons made the second of two free throws with five seconds left to play. 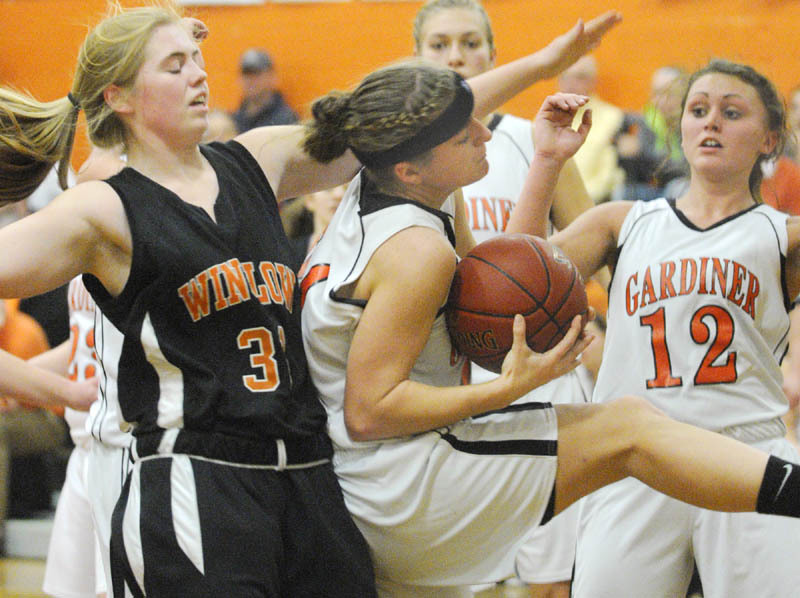 Gardiner is 5-2 while Winslow is 3-5 in Kennebec Valley Athletic Conference Class B play. “It’s a really big win because we’ve been on a losing streak for the past four games,” Fitzgibbons said. The 5-foot-3 sophomore converted a driving layup to give the Black Raiders a 42-41 lead. A free throw from Erica Bertolaccini pushed Winslow’s lead to two before the Tigers tied it at 43 on Kylee Granholm’s slick assist to Kelly Macomber for a layup with 41 seconds to play. Fitzgibbons was fouled with five seconds left and missed the first of two shots. Fouls were an issue for both teams. Sixty were whistled in all, 33 on the Tigers and 27 on the Raiders. Gardiner made 19 of 33 while Winslow converted 23 of 36. Two Gardiner starters fouled out while both Granholm and Macomber were in foul trouble throughout. The Tigers nearly won the game at the buzzer as Granholm drove into the paint and dished to sophomore Rachel Quirion but her shot fell off the rim. The Tigers led 17-5 in the first quarter as they fed the ball to the 6-foot Macomber and forced the Raiders into six turnovers against their zone press. Fitzgibbons finished with 12 points, including a long 3 at the first period buzzer to make it 17-8. With Granholm and Macomber both on the bench with their second foul in the second quarter, the Raiders chipped away at the lead. Sophomore Alyssa Wood scored five of her game-high 16 points in the final minute and 18 seconds as Gardiner led just 26-18 at the half. With four Gardiner starters wearing four fouls apiece, Winslow went up by six points (40-34) in the fourth quarter. The Tigers didn’t fold and retook the lead when Liz Kelley hit a 3 from the right side to make it 41-40 and set up the wild finish.